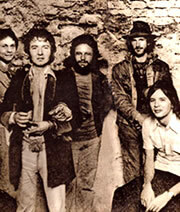 Charlie was lucky enough to spend much of the '70s working with Ronnie Lane. Charlie worked on several albums, had some brilliant times on the road, and even helped Ronnie sow a field of Barley at his farm in the Shropshire hills. Following Ronnie's death from MS, Charlie was asked to put together a Slim Chance line up to act as house band at a projected Ronnie Lane Memorial Concert at the Albert Hall in 2004. The band that Charlie assembled contained Henry McCullough, Chrissie Stewart and Alun Davies (all of whom were original Slim Chance members) and they were joined by Geoff Dugmore and Geraint Watkins.They performed a couple of songs as a unit and were then joined by a succession of guests: Keith Smart, Chris Jagger, Sam Brown, Glen Matlock, Mick Jones, Pete Townshend, Paul Weller and finally Ron Wood. 'never before has the Royal Albert Hall played host to such an atmosphere of love and deep respect as it did on the evening of 8th April'. Following this concert, a documentary on Ronnie's life was screened by the BBC 'The passing Show, the life and music of Ronnie Lane' and is now out as DVD on Eaglerock. The DVD is an extended version of the BBC program with extra footage.